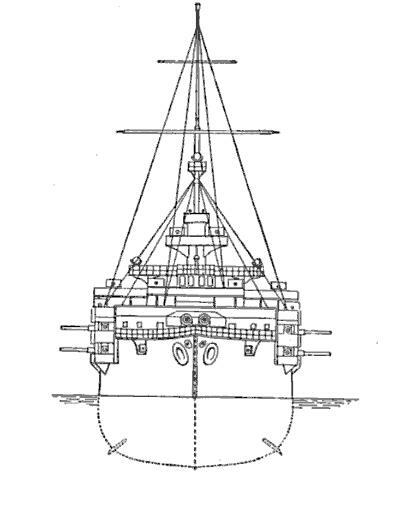 After the three Monarchs in 1898, the director of shipbuilding Siegfried Popper studied the design of a deep-sea battleship, the first since the Tegetthof of 1878. 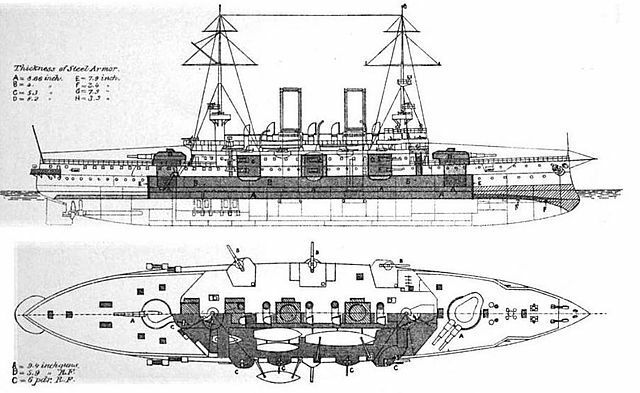 Unfortunately, the low credits allocated for its construction generated a ship inferior to other battleships of the Time: In terms of tonnage, the new design first claimed only 8,200 tons standard, while at the same time, the German SMS Wittelsbach claimed 12,700 tons, the Borodino 13,500, the French Republic 14,600, and the British Duncan 13 700 tons. This low tonnage generated limits of hull strength and artillery size, such as the standard “normal” of that time, 12in (305 mm). It had to be abandoned in order not to compromise the strenght of the hull and after a short time, it was decided of the acquisition of Krupp guns of the 9.4 in caliber, or 240 mm, already tested with the Monarch, but arranged in a single aft turret and double fore, instead of the two expected doubles. That was one of many other specifics about these “ships on a budget”. With artillery of this caliber, armor was rated accordingly and therefore considerably lower than on many contemporary battleships. Finally, the small size of the hull implied a limitation of available space for boilers, but its had fortunately no consequences in terms of speed. With 19.6 to 19.8 knots, these battleships were in the norm. Among other peculiarities, they sported their secondary artillery in two stages barbettes, making them very recognizable. This configuration was later abandoned. Main artillery consisted of the three Krupp 9.4 in 40 caliber C97, and 150 mm Krupp of 40 caliber C96, whereas anti-TB armament comprised 70 mm Skoda 45 caliber and 47 mm Skoda 44 and 33 caliber rapid fire guns placed in the superstructures. The choice to place the double turret forward, in chase mode, also responded to the lack of armor at the rear. The belt was 2.44 m high, at the waterline, extending over the ram to a thickness of 100 mm. The blockhaus was reinforced by two 220 mm crosspieces, and the central bulkhead was 63 mm in thickness. The double casemates were protected by 125 mm of armor. The central casemates had a more pronounced corbelling which, added to the shape of the hull at this location, allowed a 180° angle. The engine consisted of two four-cylinder, triple-expansion engines, combined with the low displacement of the vessel allowed a good top speeds, exceeding 20 knots during sea trials. On two ships, the additional weight had been eliminated by removing a deck in 1911. Range was limited to 3,200 nautical miles, mainly because of the ships’s reduced holds for coal, of only 800 tons, but logical in a planned use in the Adriatic. The Habsbug, Harpàd and Babenberg were started at STT (Stabilimento Tecnico Triestino) from 1899, launched between 1900 and 1902 and entered service in 1902-1904. In 1914, these three units formed the 4th Line Division within the Active Squadron. 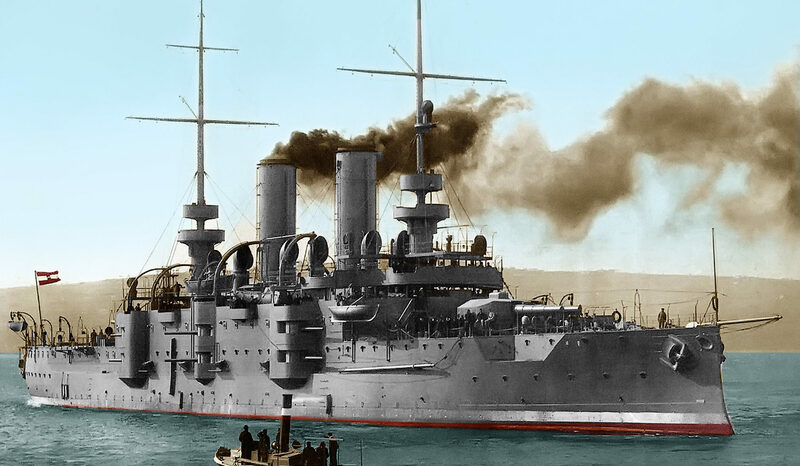 The name did not reflect their activity precisely, because apart from the Habsburg who shellied Ancona, and after the first operation on the Montenegrin coast by the three battleships, they remained anchored in Pola until 1918. In 1917 they were decommissioned as coastal defense ships already. In 1919, the peace treaty had them attributed to Great Britain who had them broken up in Italy in 1921. Habsburg and Árpád took part in fleet maneuvers in mid-1903. 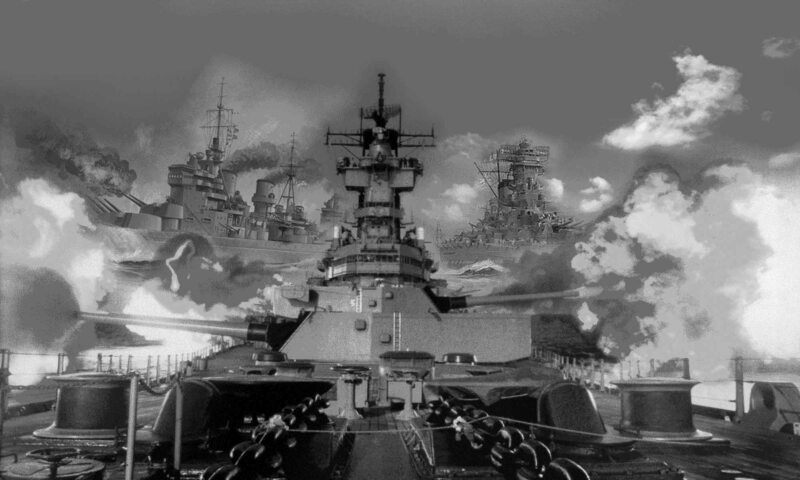 In 1904 the three Habsburg-class battleships engaged the three Monarch-class battleships in a simulated battle which also saw for first time two squadrons of modern battleships. They joined the I Battleship Division. Habsburg served in the Mediterranean Sea, starting a training cruise in January 1903. However with the acceptance of the Karl-class battleships from 1906 the Habsburg-class ships were ended in the II Division and in in 1910 SLS Habsburg entered drydock for a comprehensive modernization. She was also lightened with one deck removed and sh becae a coastal defense vessel. In August 1914, Habsburg was the flagship of the III Battleship Division under command of famous Captain Miklós Horthy. 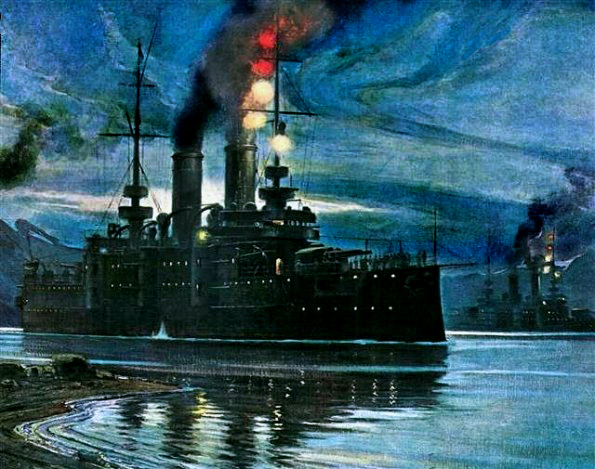 She was mobilized to support the SMS Goeben and SMS Breslau “mad run” towards the Dardanelles. The squadron was recalled after advancing as far south as Brindisi in southeastern Italy, probably the longest trip these ships ever made in wartime. Habsburg was transferred to the IV Division with the arrival of the new Tegetthoff-class battleships and went to shell several Italian ports along the Adriatic coast. In particular Habsburg bombarded Ancona on 23 May 1915, reducing to rubble the town’s train station, the St. Stefano military camp and dueled with Ancona coastal batteries. However after this actionshe sailed back to Pola. The shortage of coal and superiority of the italaian Navy, and soon of the Entente naval focres in the area, condemned the ships to inaction, or waiting for n eventual sortie. Habsburg was decommissioned in Pola and became as a harbor defense vessel while Her crew was transferred to the new U-boats and aircraft of the fleet. 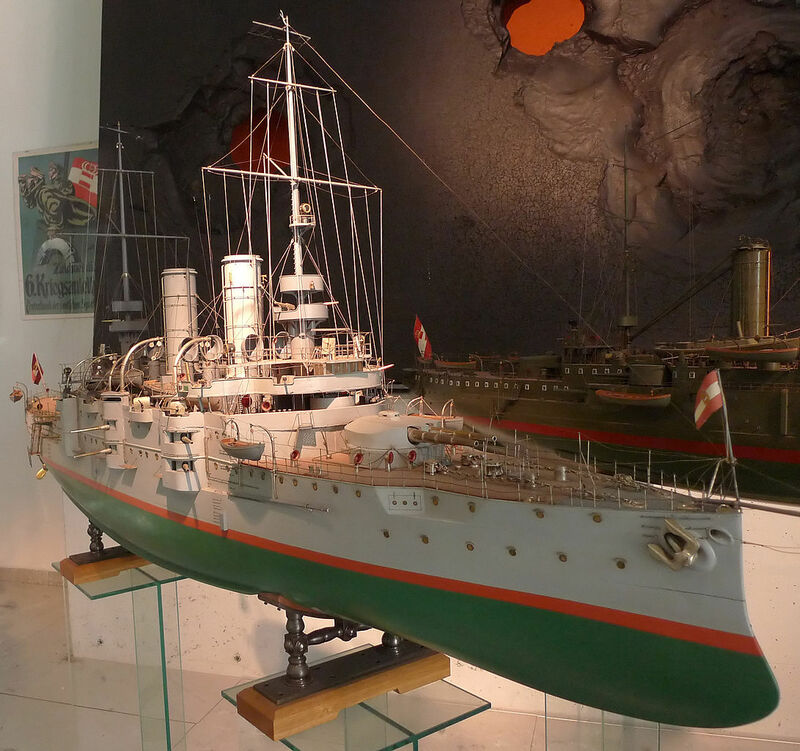 In 1918, she was re-commissioned as a training ship and joined the Austrian Naval Academy. She was awarded to UK as a war prize, resold to Italy and broken up for scrap in 1921, like her two sisters. 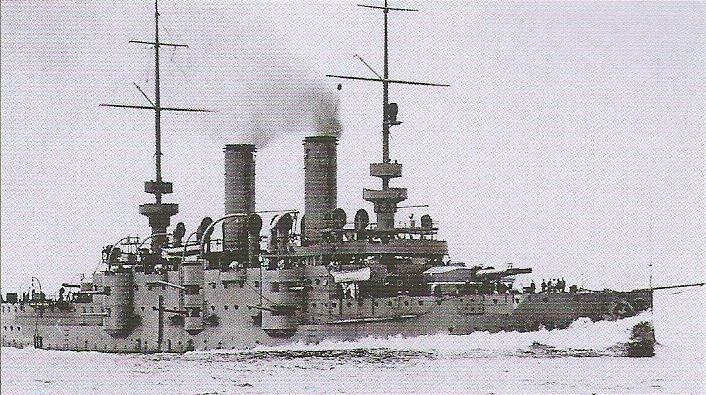 Árpád participated from 1903 in many fleet drills and simulated war games with the I Battleship Division. She went in a long training cruise in the Mediterranean with the Monarch-class battleships and was later relegated to the II Battleship Division. 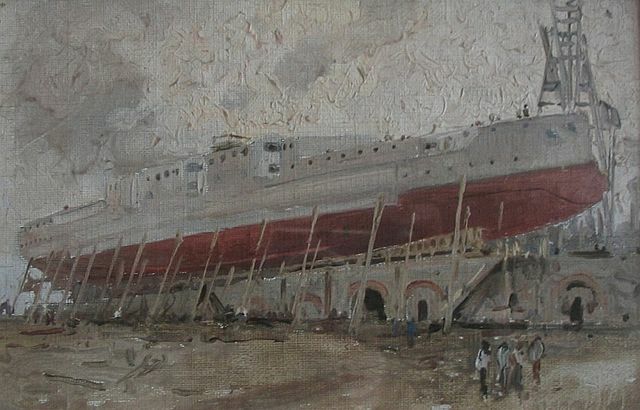 From 1910 Árpád went through the same drydock modifications, her superstructure decks being removed to save weight. During the war she served with the IV Division and was mobilized during the Goeaben flight, to support her in the strait of Messina against British vessels. In 1915 she raided several Italian port cities along the Adriatic coast and Ancona on 23 May 1915, but afterwards came back to Pola and stayed there in total inaction until the end of the war. She was commissioned in 1904, first with the I Battleship Divisio, then II Battleship Division, and apparently from 1912, the IV Division of the Austro-Hungarian Navy. 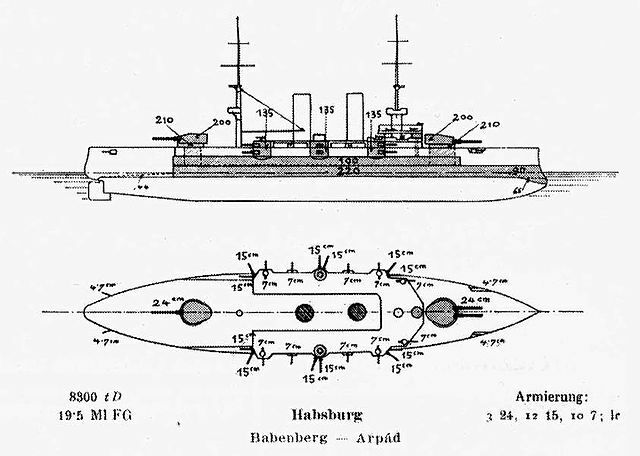 Like her sisters, SMS Babenberg sailed to support the Goeben rush in the Mediterranean, about as far as the strait of Messina to be prepared to duel with British ships here, and turned back off Brindisi. 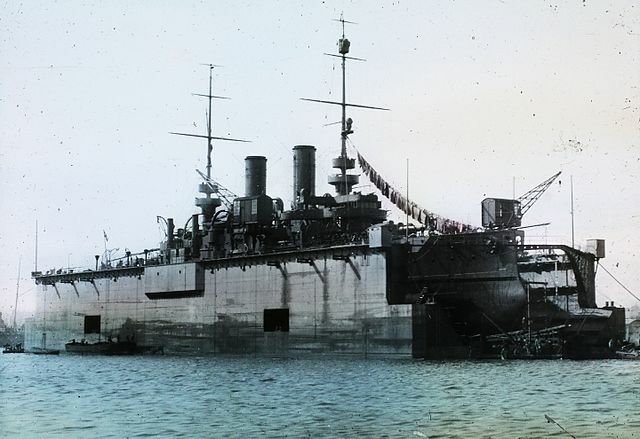 Like the others she bombarded Ancona in 1915 but returned to Pola and was confiend there, with a reduced crew, decommissioned and used as a harbor defense ship. She became a war prize in 1921 for UK which had them resold to an Italian demolition shipyard.